Netflix streaming in the U.S. fell 25% "from normal levels" this past Sunday, according to a report that pinned the blame on the Olympics. NEW YORK (CNNMoney) -- In the competition for streaming video eyeballs, Olympic gold stole some of Netflix's luster this weekend. Netflix streaming in the U.S. fell 25% "from normal levels" this past Sunday, according to a Procera Networks report this week. The report pinned the blame squarely on the Games, which kicked off July 27. Last week, Reed Hastings and Co. warned in Netflix's earnings report that Olympic viewing will have "a negative impact" for the current quarter -- on both Netflix (NFLX) watching and on new subscriptions. Some analysts cried foul, accusing Netflix of using the Olympics as a scapegoat to explain away a potentially weak third quarter. But Procera's report this week appeared to confirm those fears. Netflix rep Jonathan Friedland downplayed the report, saying in an e-mail that "Procera's pattern matching technology may not be 'seeing' all our traffic" because of the way Netflix's network set up. Friedland did say that Netflix's "U.S. traffic has gone down by single digits week on week at various points since the Olympics have started." NBC is allowing users to stream the Olympics on its own website or via its free Live Extra app. The Games began last Friday, and by Sunday the Olympics streaming volume doubled compared with the first two days of events, Procera said. Related story: Do the Olympics cost too much for host cities? "Something had to give, and in this case it was Netflix," Procera analyst Cam Cullen said. Of course, a one-day drop in streaming won't affect Netflix much in the long run. But if those issues continue through the Olympics' two-week span, that could become a serious problem for the company's bottom line. Netflix devoted a significant portion of its Q&A time to the Olympics during its post-earnings conference call last week. 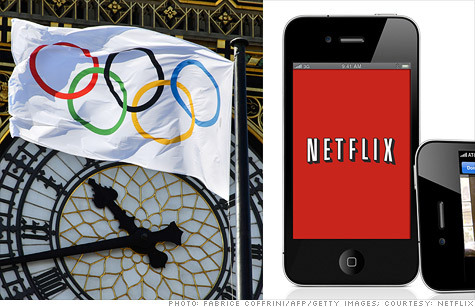 Netflix CFO David Wells said it was tough to analyze how much the last Summer Olympics -- the 2008 Games in Beijing -- affected new subscriber sign-ups, because the company happened to have a three-day DVD outage at the same time. "I would say that we did feel some impact and there's uncertainty around whether that impact is permanent ... or if it's just a deferral through the games," Wells said. By contrast, the 2010 Winter Olympics in Vancouver "had a small negative effect," Wells said.